A few weeks ago I ran in the Heroes in Recovery 6K. If you haven’t participated in one of their events you’re missing out! It’s fun, well organized, and full of passionate volunteers. This was my second time running the race and this year I asked my 7 year old daughter to run it with me. Leading up to the event I wondered how I would respond when she asked about why we were running the event or who the event benefited. I thought of how was I going to explain recovery, addiction, and the need to break the stigma. In the few days leading up to the event I realized I was overthinking how I needed to respond as a parent. Instead of worrying about “what if” I need to just start providing my daughter with experiences to shape her perspective. Parents can probably relate to those moments when you don’t know how to respond or what exactly to say. Maybe you’ve been caught in a response which didn’t make sense or elicited more questions from your child. I’m not in recovery, but I support the recovery community in my personal and professional lives. In signing up for the Heroes race I soon realized that I didn’t need my daughter to understand what addiction or recovery is, rather it was my job to show her the importance of community. 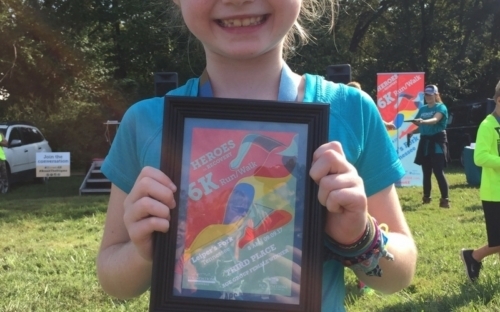 Throughout the Heroes 6k event we could feel the support of others. As a participant you’re cheered on by fellow runners, those on the sidelines, and as you near the finish line there’s a roar from the crowd. During the ceremony after the race we learned more about the The Next Door Nashville (the benefiting charity for the event), the purpose of the event, and some stats around the Heroes 6k movement. It’s that passionate, driven, and purposeful community that I want to expose my daughter to. My hope is that by participating in these types of events she’ll understand her role in our community, she’ll be exposed to people who have experiences different than hers, and she’ll grow to become a supporter of causes that make us collectively stronger. Driving home from the event she was talking about next year and how she wanted to have the whole family participate! I’m inspired by her passion and excitement and I hope that as she grows up and understands more about the causes we’re participating in, that passion will only strengthen. Interested in participating in the 2018 race? Signup now!